That's the first thing Canton Classic Car Museum director Char Lautzenheiser tells visitors, and we found that to be more than true when we recently toured the Ohio museum with her. Lautzenheiser fell in love with museum when she toured it as a young girl with her father, shortly after the its 1978 opening, and she began working at the museum in 1986. "I feel right at home here," she said, as she led us through the museum. 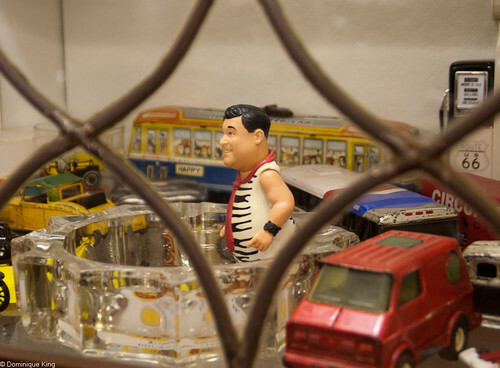 The museum really does have a homey feel to it with vintage toys tucked into unexpected corners, Oriental-style rugs covering many of the floors, and chairs scattered around the building where visitors can sit and enjoy the kaleidoscope-effect of the museum's eclectic collections. The museum's 45-car collection ranges from a 1901 curved-dash Oldsmobile to a 1970 Plymouth Super Bird, with plenty of vehicles in between. You can check out iconic cruising cars like the Super Bird, a 1957 Chevy Bel-Air or a 1959 Cadillac Biarritz, but I especially enjoyed some of the museum's quirkier vehicles. 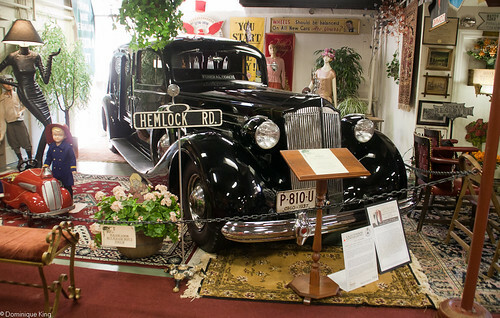 A 1937 Packard hearse with a V-12 engine and hand-carved mahogany body panels resembling black curtains sits alongside a small "funeral parlor" and behind a street sign for Hemlock Road, in one of just many instances of the museum's quirky sense of humor. Lautzenheiser invited us to sit among the potted plants in the parlor area next to the car on a quiet day and listen as she opened the hearse's side doors with a prolonged "creeeeeak" and asked "What does that sound like?" Tim and I agreed that it sounded just a door opening on the old "Addams Family" or "The Munsters" television shows, and Lautzenheiser laughed as she told us that was a favorite stop with some of the museum's youngest visitors who like slightly spooky stories. 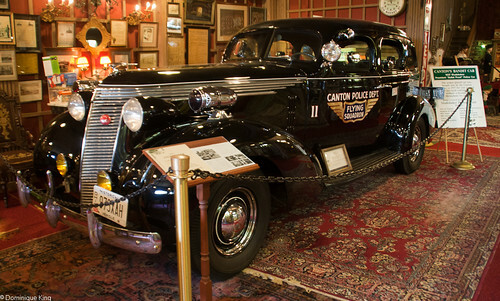 A black 1937 Studebaker Canton Police car sports bullet-proof windows more than one-inch thick that have gun portholes in the middle of them, making it easy to imagine yourself in the midst of a car chase involving some of the 1930s most notorious gangsters. 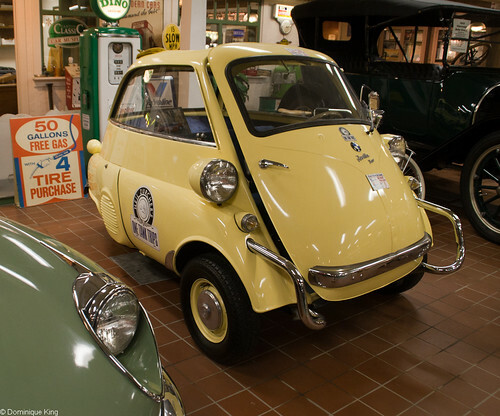 This cute little Isetta is a 1957 BMW vehicle used by retired television reporter Neil Zurcher during trips he did for a northeast Ohio television show called "One-Tank Trips". The one-cylinder car got about 77 miles per gallon, and if you look closely, you see that the entry door is at the front of the vehicle. 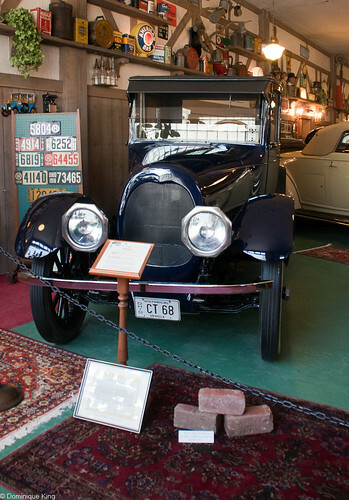 The museum has a 1922 Holmes car built by a Canton company owned by Arthur Holmes. The company built about 500 air-cooled luxury vehicles, billing them as the country's most comfortable cars, although some wags called the car the homeliest on the road at the time. Check out this 1918 Holmes Automotive Company newspaper ad about a test drive from Canton to New York and touting the car's superior performance over rough roads, steep mountains, and winter storms while averaging a "remarkable mileage of 13 miles to the gallon". The company lasted only from 1917 until 1922, failing after charges of embezzlement and fraud against a company vice president. The building itself has an interesting story and links to early automotive history in Canton. George and Joseph Sacher opened a bicycle repair shop there in 1913. They got wind of news that the nation's first transcontinental highway-The Lincoln Highway-would pass within six blocks of their business and quickly switched their bicycle shop into an automobile garage. The garage was the largest Ford dealership in the country as the Sachers convinced Ford to ship parts to their business in order to more economically assemble cars in Canton. The dealership lasted until 1929. In 1978, Marshall Belden Sr. established the Canton Classic Car Museum in the building to store his antique car collection and share it with the public. Cars weren't that interesting to Mrs. Belden, who added her own nostalgic items into the collection. 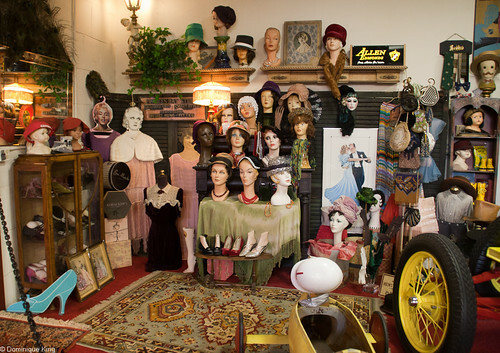 The museum has vintage clothing, movie memorabilia, toys, furniture, advertising signs, a few items from Canton's defunct Meyers Lake Amusement Park, political memorabilia, and some things that just defy easy categorization. It's like a real treasure hunt as you move from room to room, never knowing just what you'll find lurking in a corner, tucked into a shelf or hung high upon a wall. The treasure hunt continues online where I recently saw the museum selling everything from a rare, ready-for-restoration 1933 V-16 Marmon to pallets of assorted foreign car parts to a 1994 Saturn factory cut-a-way display vehicle. If you happen to tour the museum with Lautzenheiser, you'll have a great time learning about the collection. A word of warning, though, don't try to stump her when it comes to automotive lore and history. The woman knows more about those subjects than anyone I've ever met! Be sure to check the Canton Classic Car Museum site for discount coupons, and visit the museum on Facebook. Want to learn more about America's first coast-to-coast highway? Check out The Lincoln Highway: Coast to Coast from Times Square to the Golden Gate by Michael Wallis. This book proved invaluable to us as a guide when we traveled the Lincoln Highway through Ohio. Check out Tales from the Road: Memoirs from a Lifetime of Ohio Travel, Television and More by Neil Zurcher or Ohio Oddities: A Guide to the Curious Attractions of the Buckeye States by Neil Zucher to learn more about off-the-beaten-path adventures in Ohio. Check out Discover something for everyone at the William McKinley Museum and First Ladies' National Library and historic Saxton-McKinley Home for more about Canton's museums. Thanks to the Canton-Stark County Convention & Visitors Bureau for their assistance with planning our recent visit to Canton and arranging for comped media passes to the museum. Yup, it was kind of difficult to take it all in the first walk-thru. Many of the vehicles were really unique, and it was like a treasure hunt walking around the place. You never knew what you'd find! That looks like a pretty fun museum for adults and kids. I really like the classic cars. This is certainly the place for classic cars...and really unusual vehicles!